New from MSI International, Inc. is Capella, a fresh and unique take on Old World style. 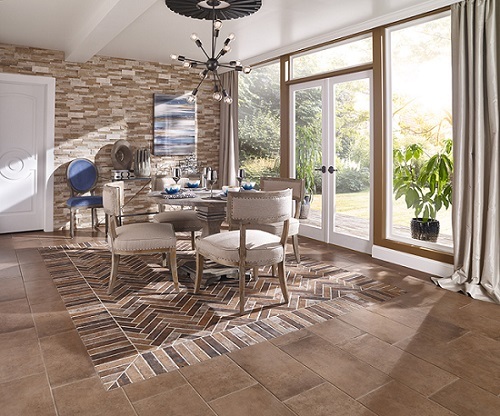 Capella is a stunning, glazed porcelain tile collection that offers three distinct looks – Cotto, Wood Planks, and Bricks. Inspired by old-world terracotta, rustic, and vintage styles, this one-of-a-kind line features coordinating looks that have been modernized for today’s consumer. Capella Cotto takes the popularity of this paver look and infuses it with today’s most popular color choices – including a milk chocolaty caramel Clay, warm gray Silt, lighter neutral Sand, and soft, off-white Talc.The exclusive color palettes of Capella Cotto could only be achieved by the artistry of Italian manufacturing employing the latest in inkjet technology. 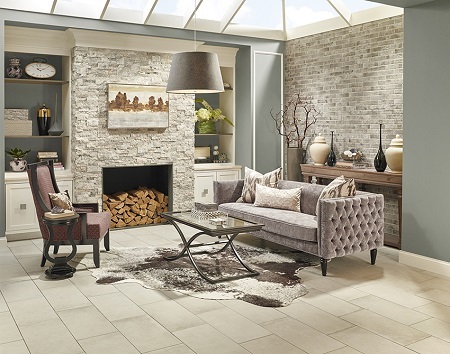 The tiles are pressed to create soft, pillowed edges and come in both 12×24 rectangular and large format 24×24 square sizes,complete with a 3×18 bullnose. As the popularity of wood look porcelain tile continues to grow, Capella Wood Planks bring a truly authentic wood look in unique colors to the market. Featuring similar gorgeous colors of Capella Cotto, the planks are pressed for a more realistic wood look and are offered in an on-trend, large format 6×40 size. They can be used in a contemporary space; and because they have a hand-scraped wood look – even some saw marks – they can also complement a more rustic design.